In order to determine where the future of home design is going, we need to take a look at where it’s been. Back in 1975, the average size of a Canadian home was 1,050 square feet and the average family in 1965 consisted of 3.5 people. It was pretty much your ideal television image of life in the 60’s and 70’s. Fast forward to modern-day Canada and the homes have gotten steadily bigger while the average number of people per household has dropped to 2.5. In 2010, the size of the average home in Canada had ballooned to 1,950 square feet, so most people are living much more spacious lives than the generations before. If you’ve ever lived in a the mid-20th century or earlier, you will understand what we mean when we say electricity has come a long way. Back then, homes may have had a handful of electrical outlets in each room – enough to accommodate some lamps, a radio and a television. Today, we need to account for a lot more electrical usage and we often build our homes to include an abundance of electrical outlets in walls, cabinets and floors. There’s no telling where you may need a power source these days! At the turn of the 20th century, everyone had a hardwood floor. There were no other options and carpets were typically hand-made and pricey. In 1951, about six million square yards of luxurious, tufted wall-to-wall carpeting was sold in America and by 1968 that number had skyrocketed to nearly 400 million yards. Of course, today most new homes forgo carpeting in main living areas and throughout the home, opting instead for exotic hardwoods, tile, and materials like cork. The change in finishings can also be seen in the kitchen. At one time, laminate countertops ruled the market and while they are still seen today, natural stone countertops like granite and quartz are the new standard. Kitchens and bathrooms sell homes, so it’s no surprise that bathrooms have come so far. No longer seen as strictly utilitarian spaces, bathrooms have become luxurious, relaxing escape zones from our hectic lives. 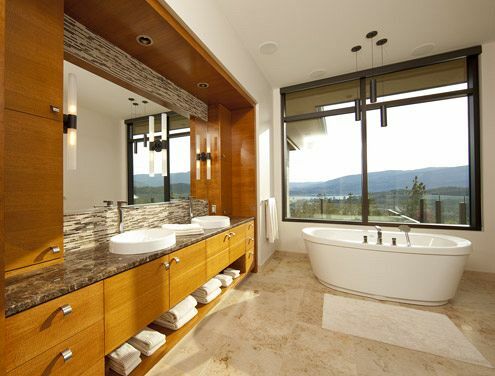 Bathrooms are bigger, brighter and include luxuries like bathtubs and separate showers with rainfall showerheads. This room is now a place where we want to spend more time and it shows in the beautiful fittings, tiles, and lighting fixtures that adorn the modern bathroom. We can’t talk about the evolution of home design and taste without discussing energy efficiency. Concerns for our environment, and a reduction in utility bills, has led to a wave of new homes being constructed to greener standards. Improvements to energy efficiency include better insulation, double-glazed windows, LED lightbulbs, and water-conserving appliances. Besides, with homes that are double the size that they used to be, we had to improve efficiencies somewhere! Your child loses their house keys, but you still have 3 hours left at work. What do you do? Well, if you are one of the millions of homeowners who have installed a smart lock on the door, you simply open the app on your phone and unlock it. But that’s not all that smart homes can do. The homes that we are building for people today are wired for everything from speaker systems to security and remote-control window coverings. Some systems even allow you to talk to your home and issue commands for things like lighting and making phone calls. By the late mid-20th century, homeowners were beginning to embrace the idea of the open floor plan. For the most part, however, older homes are broken up in small, distinct rooms. There’s no chance that you’re going to have a conversation with your guests in the living room while you make dinner – there are simply too many walls in the way! While open floor plans aren’t for everyone, they do make a home feel more spacious and it’s hard to imagine the modern 900 square foot condo with walls between the living room, kitchen, and dining room.